When you are looking to purchase a detached enclosed garage, there are many options available to customize your structure. Do you need an A-frame roof, walk-in doors, windows? Would you like a standard frame or welded trusses? Knowing exactly what you want can be a little overwhelming if you don’t know what the options are. Here, we will explore options available for your detached garage. 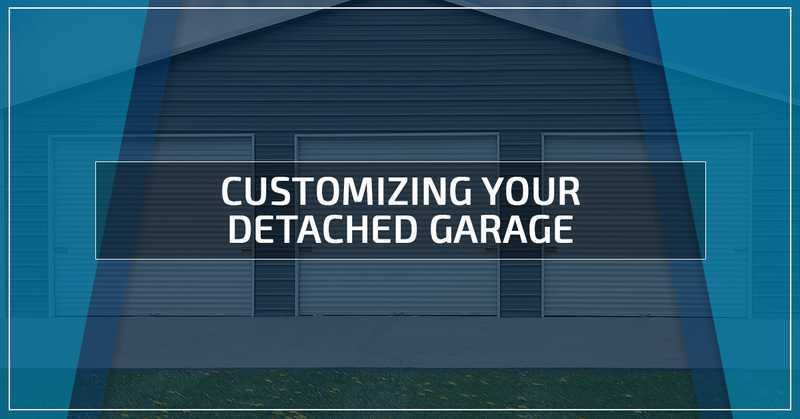 First, let’s discuss the materials you can select to construct your metal garage. Depending on what the intended use of your detached garage is and where you live influences what the ideal material is. Things to consider when selecting the fabric of your metal garage are climate, how long you would like your garage to last, and your budget. Aluminum is a lightweight and stable metal used to construct many metal buildings. Aluminum is a fairly common material because it is strong and durable, but relatively inexpensive. It can provide shelter from heat, wind, and rain. Aluminum is relatively environmentally friendly because it is recyclable. Steel is the heaviest and most durable material used to make metal garages. 14 gauge galvanized steel is the most common material used, although 12 gauge steel is also used. Steel is slightly more expensive than aluminum because it is heavier. Steel offers maximum protection and is the metal of choice of extreme weather, especially windy environments. Steel structures can be rated to withstand winds up to 170 miles per hour (hurricane Irma’s highest recorded wind speed was 180 mph). Steel is so durable because it is able to bend without breaking. Next, let’s discuss the roof of your future garage. There are three basic styles and are selected mostly by aesthetics and price. The standard style roof has rounded corners with horizontal panels. The standard style is the “classic” carport roof and the most basic model. The rolled ends meet up with the walls of the structure and does not allow for overhang. The boxed eave style is an A-frame design with horizontal panels. The box eave style is reminiscent of a residential home’s roof. This option is economical because it does not require additional support beams because of the horizontal panels. The vertical style roof is very similar to the box eave style in that it is A-framed. The difference is the panels are installed vertically which allows snow and rain to easily run-off. Because the panels run horizontally, hat channels must be installed to brace the roof. These roofs are rated to safely hold 65 pounds of snow per square foot, which makes them ideal for locations that endure harsh winters. Some additional features available for your detached garage include multiple rolling garage doors, walk-through doors, windows. Rolling garage doors are available as small as six feet by six feet, which is the size of a typical storage unit door; to 14 feet by 14 feet. Custom built detached garages can have multiple rolling garage doors on multiple sides of the building. Walk-thru doors are similar to residential home doors and can be installed on one side or multiple. Windows are available in several options and selections include 12-inch by 12-inch glass panels or fully screened and openable 24-inch by 36-inch windows. Other options include color matching and insulation. 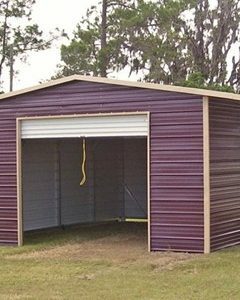 Prefabricated metal garages come color stained, but custom-made metal buildings can be color matched to your home. Insulation is available, usually at an additional charge, on all metal buildings. Now you know all about your options for the detached garage you’re looking to invest in, you can make a well-informed decision. Before shopping, it is a good idea to make a budget and have a general idea of features you would like. You may also want to think about color and dimensions, being mindful that your garage should exceed the dimensions of what is meant to be stored inside. You’ve invested in what you intend to store inside your detached garage, make sure the same effort is put into the structure that will house it! The metal building experts are Wholesale Direct Carports can help you with all of the options. They also offer free delivery and installation as well as rust and workmanship guarantees. Call for your obligation-free estimate today!